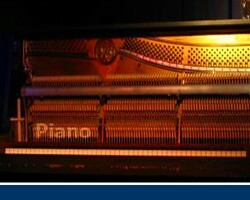 Detunized has announced the release of “Piano”, an Upright Piano in a small venue. Detunized Piano translates the spirit of a pretty old and battered Upright Piano into digital realms. Hosted in a small venue right beside an auto shop this particular Piano has undergone numerous Jazz and Blues sessions throughout the decades. Ableton Live Pack, compatible with Live 8/9. Arper adds some heavenly arpeggios. Damped sounds like a huge piano behind a wall. Looped introduces random patterns during performance. Morph combines formant-shifting with interesting side-noises. Piano is the pure velocity-layered piano sound. Peak brings in the taste of a prepared piano. Remember 2133 can be tweaked from Grand to Honky Tonk. Synth is a polyphonic stereo synthesizer. The Piano for Ableton costs 9 EUR. Detunized Piano in Universal Format contains the velocity-layered sustain samples plus release sounds in separate patches. Both patches can be combined in numerous software samplers like Kontakt, NN-XT, EXS 24, Halion, DirectWave, Dimension as well as each other software sampler that reads Cakewalk SFZ files. SFZ, NKI, SXT, EXS, FXP files included. The Universal format Piano library is also 9 EUR.